Currently supplying about 11% of global space and water heating needs, most heat networks today are fuelled by either coal or natural gas, while the national renewable energy share can range from 1% in China to 42% in Denmark. In the UK 29.8% of all electricity in the second quarter of 2017 came from renewable sources, most of it from wind. Onshore wind generation increased by 50% in 2017, while offshore wind energy rose by 22%. 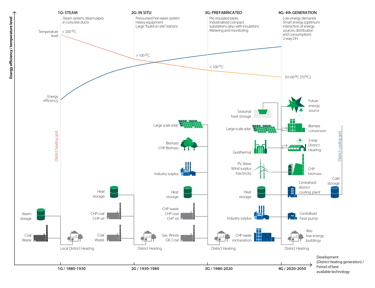 While it is well accepted that heat networks are a key element in reducing carbon emissions from buildings, the current 3rd generation (3G) design philosophy needs to evolve to a more flexible and sustainable 4th generation (4G) for the technology to reach its full potential. A new generation energy centre will typically use several heat sources. These may include surplus heat from local industry or waste incineration, wind, solar thermal, photovoltaic, heat pumps, electric cells, biomass, hydrogen and even electric boilers. In parallel, buildings are being designed with decentralised, built-in renewable energy sources, thereby increasing the overall complexity of the ‘energy picture’ as buildings become ‘prosumers’ - both consumers and producers of energy. Ultimately, we are moving to a scenario with energy from a diverse range of sources flowing to and from buildings throughout the course of each day. Accommodating this growing complexity requires the inherent flexibility and integration that is embodied in the 4G heat network design philosophy. It is now well understood (and recognised in CIBSE’s Heat Networks Code of Practice) that heat networks operate more efficiently at lower temperatures, especially where low carbon sources are in use. The 4G heat networks will favour the use of flow/return temperatures as low as 50°C/20°C. In doing so, they will facilitate inclusion of current and future renewable and low carbon technologies that require lower operating temperatures. The building designs in a 4G heat network philosophy start with the flexibility to evolve and leverage new opportunities for energy and carbon savings as they become available. They should be as energy efficient as possible using good levels of thermal insulation, natural daylight, heat recovery, intelligent controls etc. Where appropriate, buildings should also incorporate local heat and power generation technologies in combination with wind, solar thermal, photovoltaic, air or ground source heat pumps, electric boilers and thermal storage. Heat emitters in these buildings will need to operate at lower temperatures than is traditionally the case. 4G heat networks also need to incorporate intelligent metering to help optimise the operation of the energy centre, identify opportunities for improvement and help consumers adjust their behaviour. One of the main challenges posed by intermittent energy sources is that times of highest generation may not coincide with times of maximum demand, creating a need for reliable and cost-effective energy storage. As much of this surplus will be electrical energy (from wind, solar, tidal) batteries are often seen as the obvious storage solution. However, current studies show that storing energy as hot water can be more than 100 times less costly than battery storage. 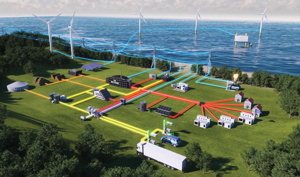 4G heat networks are able to exploit surplus electrical power by converting it (for example via heat pumps or electric boilers) to heat energy for storage. For larger district heating schemes, a low-cost heat source, such as waste heat, is a great start to minimise carbon emissions, cost and disruption. Where such low-cost heat sources are not available it is generally more feasible to consider smaller block or communal schemes. These are very straightforward and require only installation of heating and hot water pipes in the building, creation of an energy centre (typically on the same site – plant room) and provision of heat interface units in each space being heated. The size of those schemes can vary from a couple of 10s to large multi-dwelling developments. But, in order to achieve 4G heat networks, further policy development is required. Although the heating and cooling sectors account for about 48% of final energy use and although the UK is one of the leading countries in renewables’ growth, renewable heating and cooling has a long way to go. Renewable power alone receives much more attention from policy makers than does renewable heating and cooling and it only accounts for 20% of final energy use. With an overarching need to reduce carbon emissions, the necessary policy framework goes hand in hand with planning and managing a transition to 4G heat networks that combine and utilise production and consumption between heating/cooling, electricity, gas and transport grids. Such sustainable networks will focus on the wider use of low grade renewable and waste heat sources, with the ability to store the surplus energy and manage the intermittent energy sources efficiently. 3G heat networks have certainly served a purpose, but they are limited in their ability to address these requirements, as they lack the key ingredients for a flexible, responsive and sustainable system that continues to evolve. In short, our energy systems are continuously evolving and our heat networks will play a key part as we move towards 4G.